Print : Strange Tweets: What Happened to the Ahmed Jabari Assassination Video? 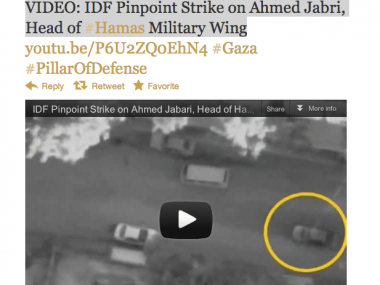 Strange Tweets: What Happened to the Ahmed Jabari Assassination Video? Since early Wednesday morning, all eyes have been on the developing digital landscape of the Middle East. Israel Defense Forces have launched a full-scale social media assault on Hamas in conjunction with a tactical military campaign. The IDF’s Twitter account has received the most attention, especially after the group tweeted a link to a YouTube video depicting the confirmed assassination of Hamas leader Ahmed Jabari. But something strange happened to the tweet. For about three hours, the original assassination video disappeared from the tweet in question, swapped with an entirely different one. I don’t have a screen grab (note: always take screenshots! ), but I do have confirmation from my colleague Peter Kafka, as well as the IDF itself. There’s a problem: The content of a tweet can’t be edited after it has been posted to the service. Either the tweet stands as it is, or the user can delete it from their stream. But changing what’s inside? Doesn’t happen. Thus far, no one has been able to explain to me exactly what’s going on. Situation A: Someone inside Twitter screwed up. Maybe an engineer pressed the wrong button, maybe there was a mix-up in links this morning when YouTube accidentally took down the original assassination video. Situation B: Someone inside YouTube screwed up. After accidentally taking down the first video, perhaps an engineer put a different one back up in its place. Or situation C: An outsider figured out how to change — or hack, if you want to call it that — the link inside the tweet. Perhaps they’ve figured out a backdoor way to hijack the original YouTube link and redirect it to a separate video. The infamous hacker cohort Anonymous says it is taking action against the IDF, though there’s no immediate evidence that this is what happened here. Update 1:15 PT What I’ve been able to confirm is this: The text of the link inside the tweet itself did not change during the period the swapped video was being displayed. So it’s possible that the link was re-directed to go to the separate video that was playing for three hours. YouTube, too, isn’t saying anything beyond what it told us this morning, when it accidentally took down the assassination video. Bigger picture here: To see a change in what amounts to a fundamental part of Twitter’s structure is a big deal. Once a tweet is posted, it becomes canon. Even if you delete it yourself, there are cached copies that float around the Web ad infinitum. To alter the actual content of what you tweeted? That’s unprecedented. Would be nice to get some clarification here, but I’m not holding my breath. Return to: Strange Tweets: What Happened to the Ahmed Jabari Assassination Video?